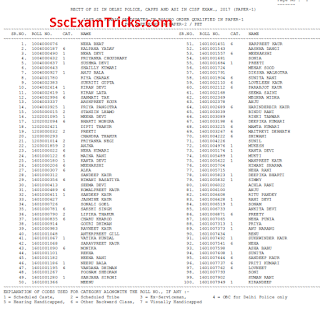 SSC SI CPO Final Result 2017 Declared for SI ASI in CISF Delhi Police – Download SSC CPO (Paper 1) Merit List 2017 Cut Off (Category Wise) at www.ssc.nic.in. - Check PET & Medical Examination Date. Latest news on 3rd November 2018 Staff Selection has released the result of CPO 2017 official website this result has been revised by the commission. The link is providing here. Latest news of 26th September 2018 SSC CPO medical exam result has been declared on official website. The medical examination was held from 5th to 18th April 2018. The medical exam result has been declared now which can be downloaded from the link given here. The good news is that, however, SSC has scheduled the declaration of result on 09th September 2017, but the result has been declared on 06th September 2017 on official website. SSC CPO Paper I Result 2017 Available on 06th September 2017: The biggest breaking news is that Staff selection commission has uploaded CPO result of Paper I for SI in Delhi Police, CAPFs & ASI in CISF. The list of qualified candidates is available on official website. The Admit card for SSC CPO Paper 2 Exam 2017 can be downloaded one week prior to the date of examination. The PET/ Medical Examination may also be scheduled to be held in October 2017. Candidates are advised to visit regional websites of SSC to download SSC CPO Paper 2 Admit cards. The official link of regional websites is given in the below table. The latest news is that Staff Selection Commission (SSC) has declared CPO result (Paper 1) on 27.07.2015 at official website www.ssc.nic.in. 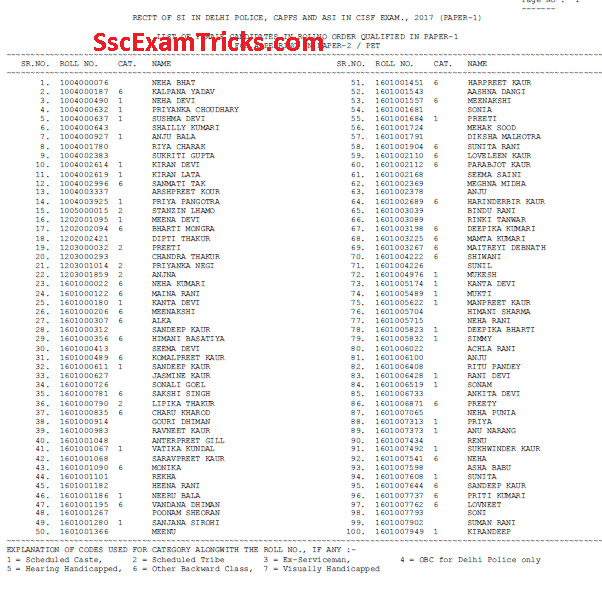 SSC has uploaded the list of shortlisted candidates called for Paper 2. The written test (Paper 1) was held on 21.06.2015 at various centres across the country. 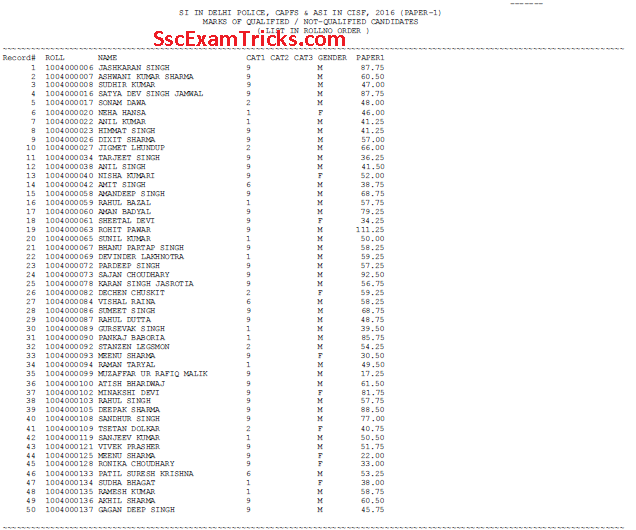 SSC CPO Result of Paper 1 examination has displayed name, roll number and category of the candidates in respective SSC Regions. The SSC CPO Paper 2 will be held on 30.08.2015. 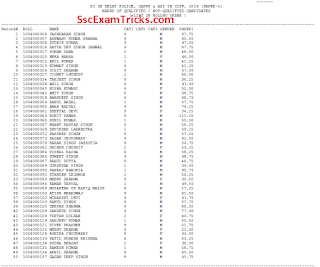 SSC has published category wise cut off marks for both male and female candidates to qualify for Paper 2 Examination. The cut off marks has displayed the number of candidates available in the respective category qualified for Paper 2 & PET/ Medical Examination to be held in August 2015. Earlier SSC CPO (Paper 1) Answer Keys had published on 06th July 2015 for SSC SI ASI written test 2015 on the official website www.ssc.nic.in for written test (Paper 1) held on 21st June 2015 at various centres across the country for the posts of Sub Inspector in Delhi Police, CAPFs and Assistant Sub-Inspector in CISF.